Our exclusive, gated mountain community offers 142 custom homes, breathtaking views and abundant wildlife. A hidden gem, nestled in the foothills just 30 minutes from downtown Denver and less than an hour from world-class ski resorts. All year-round, the Riva Chase community enjoys deer, elk, many species of birds, foxes, and even the occasional black bear or mountain lion. Look for baby fawns in the spring! 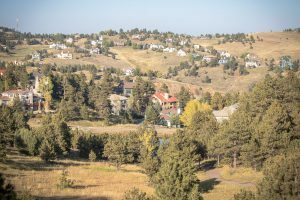 From top-notch schools to outdoor recreation, our community offers many of the best things that folks move to Colorado to enjoy. Continue reading about the lifestyle of Riva Chase. Board meeting minutes for 2019. The HOA Board of Directors invites you to join them for the Monthly Community Meeting. Riva Chase financials for 2019.